is a visually stunning book that that blends fashion, social history, and stories about members of an American family over three generations. Written by Jane Bradbury and Edward Maeder, and published by V&A Publishing, this book will interest fashion enthusiasts and the general reader alike. A related exhibition, American Style and Spirit: 130 Years of Fashions and Lives of an Entrepreneurial Family, will be presented at The Henry Ford Museum, November 5, 2016 – April 2, 2017. 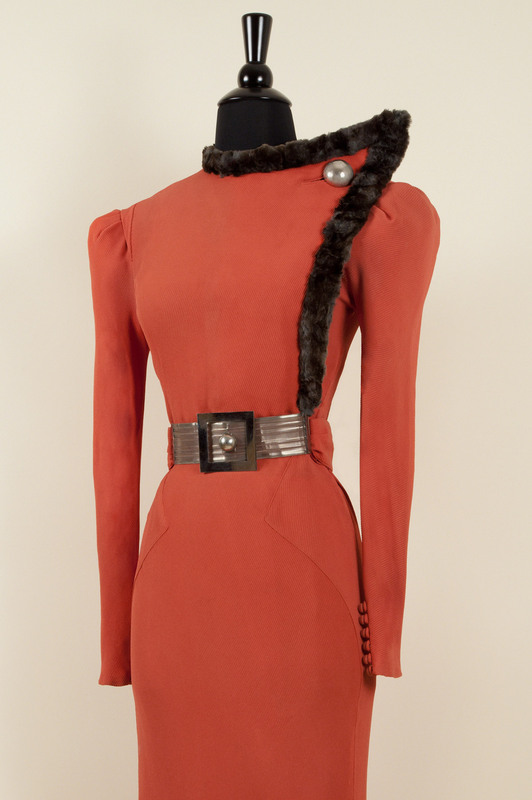 Fur-trimmed day dress with metal belt, worn by Augusta while at Northwestern University, c.1934. Photo by Gillian Bostock Ewing. THF 2014.24.49. Formal portrait of Augusta Roddis by Kay Carrington, 1937. RFPA. THF 2015.10.63.
printed pattern incorporating heart shapes c.1856. Photo by Gillian Bostock Ewing. THF 2014.24.54. Desk in Catherine Roddis's bedroom, stuffed with letters. Photo by Gillian Bostock Ewing, 2011. Satin-back rayon crêpe evening dress with circular rhinestone buckles, c.1938 (possibly made by Catherine for Augusta). Photo by Gillian Bostock Ewing. THF 2014.24.80. American Style and Spirit: Fashions and Lives of the Roddis Family 1850–1995 is a visually stunning book that that blends fashion, social history, and stories about members of an American family over three generations. Written by Jane Bradbury and Edward Maeder, and published by V&A Publishing, this book will interest fashion enthusiasts and the general reader alike. A related exhibition, American Style and Spirit: 130 Years of Fashions and Lives of an Entrepreneurial Family, will be presented at The Henry Ford Museum, November 5, 2016 – April 2, 2017.